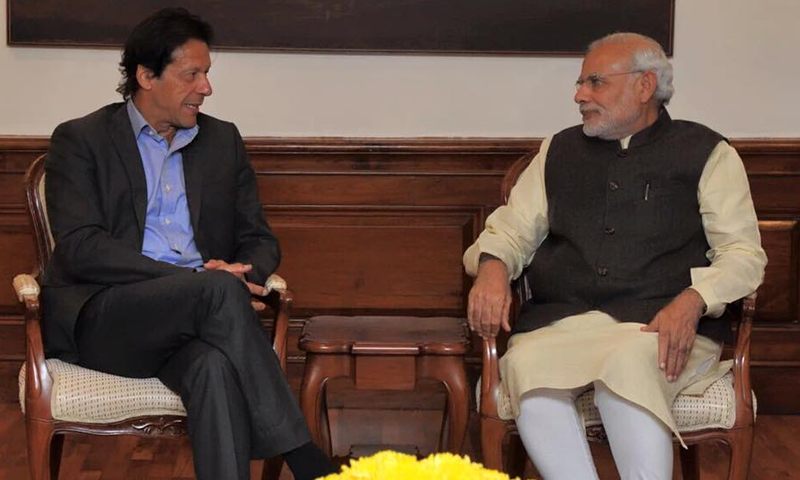 Pakistan Tehreek-e-Insaf (PTI) chief Imran Khan’s meeting with Indian Prime Minister Narendra Modi remained under discussion all over media on Friday. PTI Vice Chairman Shah Mehmood Qureshi termed Imran-Modi meeting positive, by saying that they discussed Pak-India cricket series. In a visit to the neighboring country, Imran Khan asked Modi for promoting cricket, while as per Qureshi the PM Modi gave a positive response though Imran Khan said in an Indian TV show that Modi passed a big smile which he is unable to decipher. Indian External Affairs Ministry spokesperson Vikas Swarup said that the PTI chairman called on PM Narendra Modi and invited him to visit Pakistan. He added, both the leaders welcomed the recent interaction between two neighboring countries and expressed hope that the recent developments would lead Pakistan and India to closer cooperative ties. The future of democracy is bright in Pakistan, adding that the people have developed a consensus that no system except democracy would function in the country, Imran Khan said in a TV show. Praising the Pakistani master batsman, Javed Miandad, Imran Khan said it was his big quality to perform even when he was under pressure. The former Indian captain Kapil Dev also joined PTI chief in the program and said he was too inspired of Imran Khan. "I used to copy Imran Khan's hair style," Kapil Dev said, and also told how Indian women were impressed and had crush on him as well. PTI chairman during last night’s interview said that he did not mind if Kashmir was kept in “a different package of the peace talk” so long as there was an understanding that Kashmir is a sticking point. “Sooner or later it has to be resolved,” Khan said. “I had supported South Africa’s boycott by the cricketing world during the apartheid era because it was about human rights violation,” said the Khan. Imran was of the view that any move that can improve bilateral relations between Pakistan and India, such as a cricket series, should be adopted. “We don’t want to be enemies forever. You have to think about the future. There are mutual cricketing heroes in both our countries. Like Wasim Akram is adored and loved in India, Sachin Tendulkar is a hero in Pakistan,” he said. The meeting between Imran and Modi comes days after Indian Foreign Minister Sushma Swaraj visited Islamabad and held meetings with Prime Minister Nawaz Sharif and PM’s Advisor on Foreign Affairs Sartaj Aziz. The current political situation between both the countries is a positive sign to make relations good and end the hatred between these two nations. Recently there was a surge for intolerance in India when Pakistani actors and artists visit them. After seeing the current situation, it can be conceived that Imran Khan has also made a strategy to have good bilateral relations.